Discussion in 'OT (OFF Topic) Forums' started by wemorgan, Jun 7, 2011. Does anyone know of a free software application that can predict the sun shadow from basic 3D shapes, like buildings and hedges? I've found this: Sun Shadow Applet but 2D shapes and fixed orientation are a bit too limiting. There IS one for the Iphone - cant remember what it is - I'll have a dig around. Edit: Sun Scout may do the business, but I'm sure theres a free one which may be better. Not sure if this might help, sort of coming from the other direction, if you know what I mean! That Suncalc tool is very useful. Cheers. Doesn't Google's Sketchup have something like that? 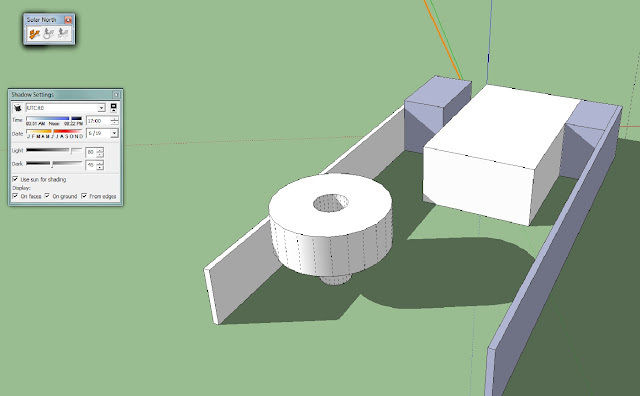 Sketchup and some software wot we use will do it. Thanks. That's given me exactly what I was after. Quite quickly I was able to build a simple house with trees and hedges and show how the sun casts its shadow.